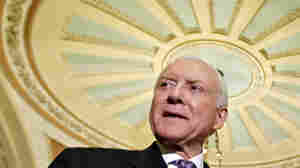 April 21, 2012  Senator Orrin Hatch (R-Utah) overcame Tea Party opposition and garnered the majority of votes at the state's Republican convention. He didn't win enough votes to claim the GOP senate nomination outright. April 17, 2012  At a Tea Party gathering in Philadelphia on Monday night, many in the crowd were only recent converts to Mitt Romney's campaign. 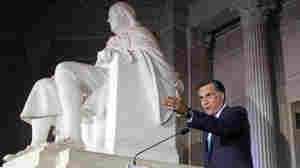 Some said a solid Tea Party vice presidential choice would generate real enthusiasm for Romney's cause. November 18, 2011  Last night in Tennessee representatives from the Occupy Memphis movement sat down with about 75 members of the Mid-South Tea Party and had what's described as a "sometimes strained and confrontational, but mostly civil discussion." Rep. Michele Bachmann of Minnesota speaks at an Americans for Prosperity "Cut Spending Now" rally on Capitol Hill in April. Bachmann built a Tea Party base before launching her White House run. October 28, 2011  Michele Bachmann has championed the Tea Party, but now one group is telling her to drop her presidential bid. September 12, 2011  In the first hour of Talk of the Nation, the influence of the Tea Party, and Simon Schama explains what makes a successful memorial. In the second hour, a bill that would speed the process of patenting ideas, and the changing portrayal of men on television. 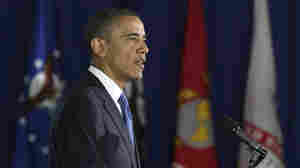 September 6, 2011  The Teamsters Union leader referred to Tea Party supporters as SOBs and used war rhetoric as he warmed up a crowd for the president Monday in Detroit. August 17, 2011  Score one for Obama. It's good to see a president who's willing meet his grass-roots critics. Of course, the question is would he as willing if he had a 65 percent public approval rating. And score one for the Tea Party activists who weren't so cowered by the aura that surrounds a president as to decide in the end to just settle for a handshake. That's what democracy looks like. August 1, 2011  Maybe Obama could get re-elected with a default under his belt. But it certainly would've increased the already considerable challenges facing him because of high unemployment, housing foreclosures and other spurs to economic anxiety. July 28, 2011  ANALYSIS: It should go without saying, this is a signal setback for the speaker, who in recent days had pleaded, cajoled and demanded that his conference get behind him if, for no other reason, to show solidarity as he confronts the Democrats who control the Senate and the White House.